I debated with myself about posting this part of our adventure. I still would like to have some visitors and I really don’t want to scare off our family and friends. But it is part of the adventure and adventures are hazardous actions of uncertain outcome. The morning after La Feria Sky came downstairs and told us that she had a ton of mosquito bites. She had bites all over her arms, face and back. Savvy pointed out that she had some on her legs. It dawned on us that many of the bites were under where their clothes had been. The bites also looked too small to be mosquito bites. Then I noticed a patch of bumps on my legs. Mike started thinking and came up with the answer: bed bugs! We looked up pictures on the internet of bed bug bites. 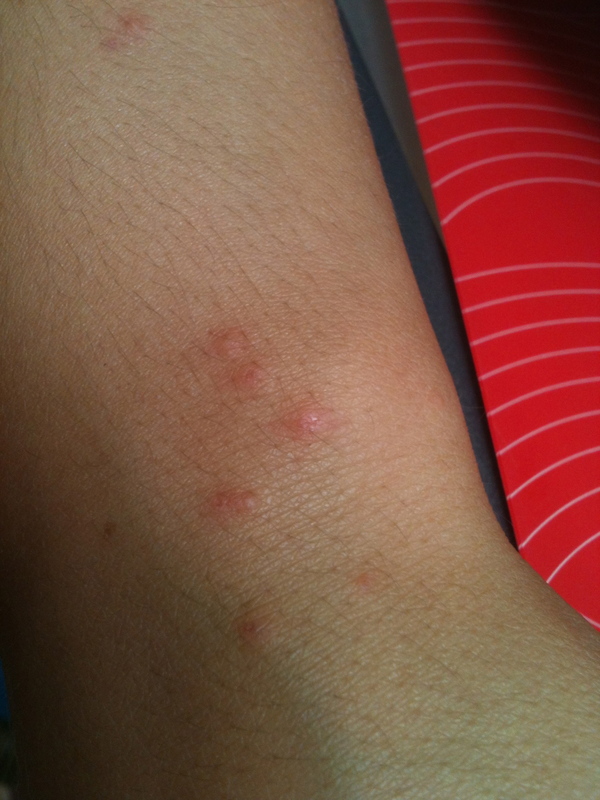 Bed bugs typically bite in groups of three evenly spaced bites. They are referred to as breakfast, lunch and dinner bites. Who knows why they do this but it makes them easy to identify. Sure enough most of Sky’s bites were in lines of 3 about an inch apart. Uuugh! So, we were able to tolerate that La Casa Azul wasn’t actually blue, we were able to buy a vacuum, massacre hundreds of spiders, scrub cat poop off of the decks and bleach pretty much every surface of the bathrooms and kitchen. We even removed all of the coverings from the moldy, smelly couches, washed them and hung them out to dry. But bedbugs??? This is stretching even my strong wishes to make everything OK. The Casa Azul had a great view and looked awesome in pictures but the internet is unfortunately not scratch and sniff! We spent the next few hours researching ways to fight bed bugs. Eventually we e-mailed our landlord. He answered back, “I am sorry to hear about your problem”. OUR PROBLEM? Now we were furious! He insisted that no one else has ever complained about bed bugs and he personally had stayed at the house without any bites. 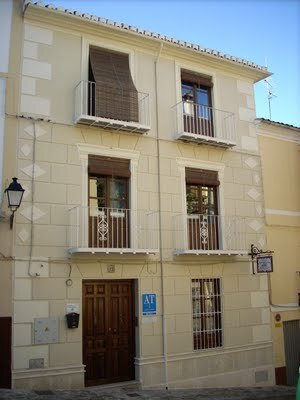 ( Mike’s note: our landlord rarely bathes, lives alone with his three dogs, and reeks of body odor- not sure that a bug would want to bite him ) He also was certain that bed bugs couldn’t be a problem in Spain, because he had not heard of that. Surely we must have brought them from America, he suggested! We did find plenty of articles about bed bugs in Spain and in every part of the world, civilized and not. We did learn a few things from our research. First, it is not recommended to just move out or go to a hotel. The bugs will surely follow. It is also not recommended to bomb a house with pesticides. Bombs don’t reliably kill the bugs and the bugs will go to the neighbors and eventually come back. We wondered why we didn’t see the bites right away. We first noticed the bites a bit more than week after our arrival. It turns out this time course is actually typical. The bumps are caused by a delayed immune response. Unlike mosquito bites, to which we react to immediately, it takes some time for our bodies to react to the bed bug bites. This is especially the case if it is one’s first exposure to the antigen (bed bug saliva). This means that if a person only stays in a place for a day or two, they might not notice any bumps for up to 7-14 days. This information was pretty horrifying as it meant that the bumps we could see were probably just the beginning. They did get worse over the next week, but with our efforts to decrease the vermin population we only noticed a few new bites each day thereafter. Another interesting fact is that up to 50% of people don’t respond at all to bed bug saliva. Initially Mike had none. I had a couple on my arms and legs and one on my chin (yuck). My bites did continue to appear and eventually I went around in long sleeves. Savannah had many on her arms but Sky, dear sensitive Sky, was covered. At one point she had more than 12 bites on her face alone. 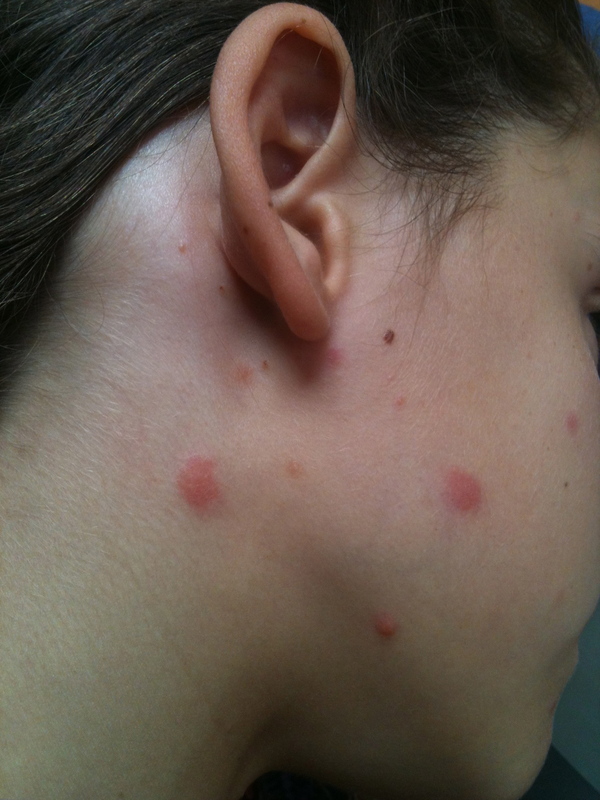 The good news is that although the bites are really gross and very very itchy, bed bugs do not carry disease. In addition, unlike head lice, beg bugs do not live on their human hosts. They prefer to live in the creases of mattresses and in cracks in the walls. This made living in the Casa Azul pretty much impossible. The walls were nothing but cracks. The ceiling in our room was made of bamboo and thatch, great bug motels. We decided then that the bed bugs were the final straw. We just could not stay in the Casa Pesadilla (Nightmare). We started looking for a new place the next day. As I write Mike is sitting next to me, he says that he is glad that I am the one who is writing because he wouldn’t be able to write about this without swearing a lot and suggests that I throw in a couple of F-bombs! While we stayed at Casa Azul we did everything we could to decrease the population of the pests. We ordered Diatomaceous Earth ( DE ) online which sounded very promising. It is a naturally occurring sedimentary rock that is ground to a powder. It is actually fossilized remains of a type of hard shelled algae that acts as a non-toxic insecticide that can be put on mattresses and around the bed. It is deadly to the bugs because it dehydrates their exoskeletons. The fine powder absorbs lipids (fats) from the waxy layer of the insects’ exoskeletons causing them to dehydrate. The arthropods die as a result of water pressure deficiency. Unfortunately, the DE never came and by the time we contacted them to find out why, we already had a new place and a plan to move. I may still try to get some DE for any trips to hotels to sprinkle around our stuff like garlic to ward off vampires! We bought alcohol and a spray bottle as alcohol is supposed to kill the bugs on contact. We sprayed dilute alcohol in every crack. We took the beds apart and completely doused the mattresses and bed frames with alcohol. We sprayed the beds with permethrin (flea, lice, arthropod insecticide) that we bought from the veterinarian. We put all of the bed legs in little bowls of baby oil as recommended on the internet. We also bought double-sided sticky tape and put it around the legs of the beds to catch any bug that might make it past the oil. I became obsessed with inspecting the seams of the mattresses and studying the sticky tape. We had a jeweler’s loop that my brother Russell had given to Sky and Savvy so we used that to study any bug dead or alive that we encountered. We did catch quite a few little bugs but none that looked exactly like a bed bug. Very disturbing as we continued to get new bites until we moved. The Casa Azul came with a washing machine but no dryer. When we first arrived I was happy to carry the clothes up 4 flights of stairs to the roof to hang them in the sun. However, as part of our exit strategy, we needed to assure ourselves that we didn’t bring bugs with us. A dryer on high heat for 30 minutes will kill bed bugs at all stages of the life-cycle including the egg. So, we drove to Granada and bought a clothes dryer to do battle with our tiny invaders. Despite the rough start we wanted to stay in Alhama mainly because the school is really nice and this has been hard enough for the girls without having to change schools again. We looked at many places in our search for a new home. We looked at everything in town that was available. In the end we traded interesting with a view for just plain clean. Our new apartment is just down the street from the old place and it really is quite lovely. Our new place is an old family home that was converted into 3 apartments. We are on the middle floor. We have 3 clean bedrooms and unlike the Casa Azul, the ceilings and walls are all finished. On our first day in the new apartment Sky and Savannah spent hours in their new bedroom playing on their bunk beds, making forts and just relaxing. It is really nice to see the girls playing on their beds without fear. It was a lot of work but we wiped or sprayed everything that we moved to the new house with alcohol and dried everything in the dryer on high heat for at least 30 minutes. 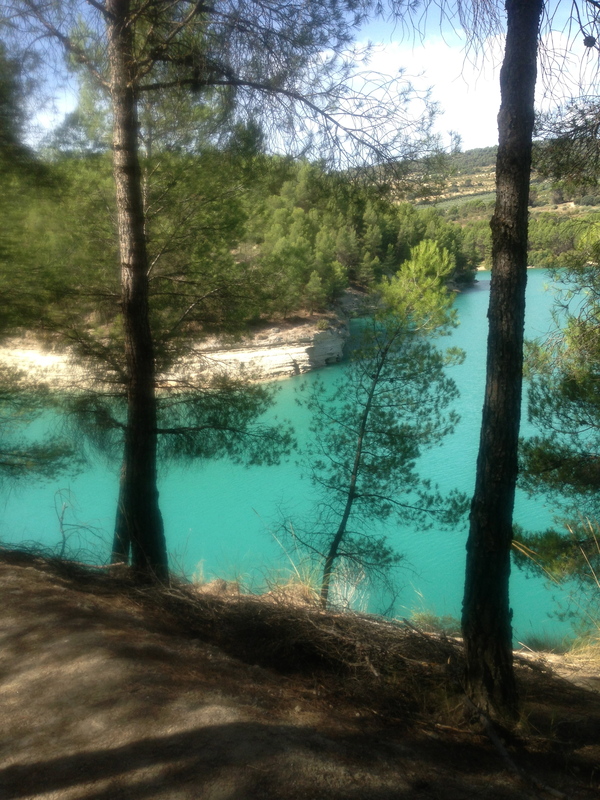 We have been in Los Apartamentos Salmerones for a week. Most of our bites are either gone or are scabbed over. I still wake up some nights worried that I feel something crawling on me but for the most part we are all feeling much more relaxed. I no longer have the urge to bleach everything in sight but I do keep my spray bottle of alcohol just in case!